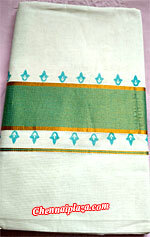 Lady's Fashion > Sarees > Kerala Kasavu Sarees. Item Description Beautiful looking cream colour kerala special saree having floral designer zari work buttis spread all over body that's beautified by floral motifs designer zari work and stripes designer green thread work decoration in pallu and a broad rich zari srtipe border. Item Description Double set mundu with extra length having rich looking zari stripes with copper colour stripe pattern on it.